RVing & Camping in the Great Lakes region. ROCHESTER, IL – The Illinois Department of Natural Resources (IDNR), in cooperation with the Rural Electric Convenience Cooperative, recently installed two elevated platforms intended to attract nesting ospreys at Sangchris Lake State Park southeast of Rochester. Ospreys – a bird of prey listed as an endangered species in Illinois – nest in large trees, on rock formations, or on artificial structures near lakes, ponds, rivers and streams, where the adults feed on fish. Elevated platforms like those installed by the Rural Electric Convenience Cooperative at Sangchris Lake have been used successfully by nesting osprey at a number of locations in the Midwest, including at the Lake Shelbyville Sullivan Beach area in central Illinois. “Rural Electric Convenience Cooperative has always had a good working relationship with the State of Illinois and Sangchris State Park, and we are happy to assist the park with the installations of the osprey nest platforms to help build the population of these beautiful birds,” said RECC Manager of Operations and Maintenance Louis L. DeLaby. 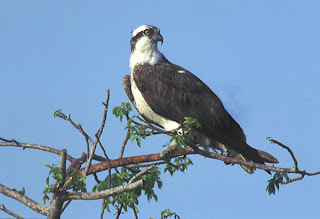 Adult ospreys –sometimes mistaken for the larger bald eagle – are generally 21-26 inches long with a black upper body and mostly-white head, chest and underbelly. Like other birds of prey, the population of ospreys in the U.S. has rebounded since the use of the pesticide DDT was discontinued in the early 1970s. No osprey nests were seen in Illinois from the early 1950s until the mid-1980s, and efforts like the platform installation at Sangchris Lake are used to attract even more nests in the state.